Federal Aviation Administration Deputy Administrator Mike Whitaker announced that the agency and the aviation community have agreed on a plan that accelerates the delivery of key NextGen initiatives to the flying public over the next three years. The agreement was reached at a meeting between the FAA and the NextGen Advisory Committee, an organization composed of airlines, manufacturers and labor groups and represents the culmination of several months of intensive and unprecedented collaboration. FK Lightplanes has begun the flight-test phase for its scale-replica carbon-fiber P-51 Mustang. The first-flight video, posted online, shows the airplane taking off and flying along the runway briefly before settling down again. Test pilot Thomas Kreimeier said the airplane was stable in flight and landing, and responded well to rudder inputs. Is it time to build your ultimate aviation-themed man cave? The producers of the series "Treehouse Matters" are on the hunt for men of all ages who are looking to build their dream man cave in 2014. This brand-new series for a major cable network will follow clients from start to finish as they work with a nationally renowned team of expert builders to create the most epic man caves and specialty rooms of their dreams. If you have a man cave fantasy that you want to see come true, email mancaves@stilettotelevision.com ASAP or fill out this online application. 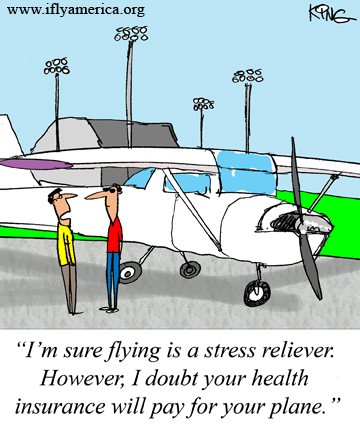 Flicker vertigo can be unpleasant and produce dangerous reactions for the pilot. A light flickering at the rate of 4 to 20 cycles per second can produce this illusion. It can result in nausea, vomiting, or, on rare occasions — unconsciousness. It affects helicopter pilots more than those in fixed wing, propeller-driven aircraft, but both are susceptible. A Miller Lancair 235, piloted by a private pilot, sustained substantial damage when it departed controlled flight and impacted terrain on takeoff from runway 18 — 2,922 feet by 100 feet dry/turf — at the Tecumseh Merillat Airport (34G), Tecumseh, Michigan. Visual meteorological conditions prevailed at the time of the accident. The personal, cross-country flight was to be conducted on a visual flight rules flight plan to Batavia, Ohio. The pilot reported no injuries. Jim Payne from Minden, Nevada, has won his third consecutive world championship in the Aerokurier Online Soaring Contest. This contest is a year-long contest with almost 15,000 competitors from around the world. To compete, glider pilots record their flights with a GPS logger and submit their flight logs to the contest web site for scoring. Payne's six best distance flights covered a total of 7,839.7 miles. In an interview with guest Rachel Payne, the discussion covers how aircraft salvage company FAST Aviation locates airplanes, gets them back flying, or parts them out to support general aviation aircraft owners. Payne and her hosts also discuss Hangar Swap, the new marketplace for aviators. Amelia Rose Earhart recently became the youngest woman to fly around the world in a single engine airplane. In this video, Red Bull Air Race Champion Kirby Chambliss takes Earhart for an exciting ride. Chambliss demonstrated the kinds of maneuvers he performs while racing, then progressed to aerobatics. According to author Jeffrey Madison: The fact that all three of my passengers were throwing up simultaneously left me three options. I could have toughed it out and pressed on to our destination; joined them in their nauseous state; or declared an emergency and got the hell on the ground.